This book examines the way in which peace is conceptualized in IR theory, a topic which has until now been largely overlooked.The volume explores the way peace has been implicitly conceptualized within the different strands of IR theory, and in the policy world as exemplified through practices in the peacebuilding efforts since the end of the Cold War. Issues addressed include the problem of how peace efforts become sustainable rather than merely inscribed in international and state-level diplomatic and military frameworks. The book also explores themes relating to culture, development, agency and structure. It explores in particular the current mantras associated with the 'liberal peace', which appears to have become a foundational assumption of much of mainstream IR and the policy world. Analyzing war has often led to the dominance of violence as a basic assumption in, and response to, the problems of international relations. 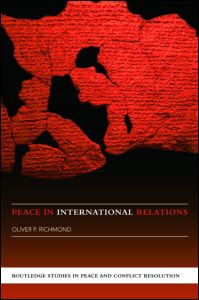 This book aims to redress the balance by arguing that IR now in fact offers a rich basis for the study of peace.